Rather than putting Johnny Cueto out on normal rest by pitching him the first game back from the All-Star Break on Friday, the Reds have elected to have Mat Latos pitch their first game of the second half. The Reds rotation after the All Star Break will now be: Latos, Mike Leake, Cueto, Bronson Arroyo and Homer Bailey. Over his last 3 starts, Latos has really turned around his season for the better. He has only given up 2 runs in his last 25 innings, has struck out 28 batters, and has a WHIP well under 1. 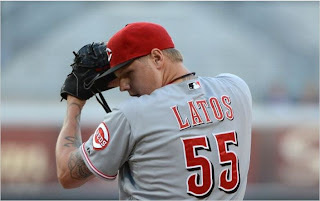 As he has shown he can be the ace the Reds expected to receive in their trade with the Padres, the Reds have enough confidence in Latos to make him their #1 pitcher down the home stretch. Giving Latos the #1 spot could give him some swagger back as being his team's go-to guy, and could only help him pitch better down the stretch. If Latos can continue on the path he is on, he could eclipse Johnny Cueto as the Reds' #1 pitcher both in the playoffs, and in the 2013 season. So who won the Mat Latos trade? Mat Latos continued his pitching tear on Thursday night as he faced off against his former San Diego Padres. Of course, adding to the interest of the game was the fact that 3 of the 4 players he was traded for were in the starting lineup for the Padres. He was pitching against former Red Edinson Volquez; and former Reds prospects Yasmani Grandal and Yonder Alonso were hitting in the 5 and 6 spots, respectively. Both Latos and Volquez pitched gems, but Latos edged out Volquez for the superior performance, as he left the game after 7 innings pitched with a 1-0 lead - only giving up 4 hits, and striking out 8. Ironically enough though, in his return to PETCO Park, Latos managed to get a no decision for 7 innings of scoreless ball, as Marshall blew the save in the 8th inning, giving up a home run to Logan Forsythe. In determining who won out on the trade, it would really seem to be a toss up. The Reds did get a dominant pitcher in Latos - and tonight he showed to be a superior pitcher to Volquez. However, the Padres also got Grandal and Alonso in the deal - who are developing into great young players for the Padres. Yasmani Grandal led off the 9th inning of this game with a double, and turned out to be the winning run, while Alonso went 2-2 with 2 walks. It looks like both teams won in the trade, but on this night Latos's shutout performance alone couldn't help the Reds overcome the contribution of the players the Padres received in the trade. After a rough start to his season, it appears as though Mat Latos has turned a corner now for the Reds. Latos has now pitched two complete games in a row, giving up just 1 run in each start. 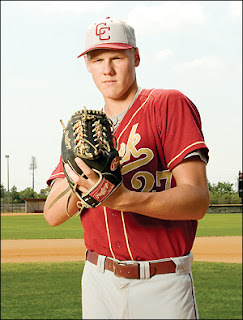 Over the two starts Latos also had 20 strikeouts, and a ridiculously low WHIP of just 0.44. Latos has now won his last 7 decisions - a new career high. It is great to see Latos finally succeeding in Cincinnati.